Copyright: © 2017 Ali A. This is an open-access article distributed under the terms of the Creative Commons Attribution License, which permits unrestricted use, distribution, and reproduction in any medium, provided the original author and source are credited. Objective: to evaluate the effectiveness of selective nerve root block (SNRB) versus pulsed radiofrequency treatment to dorsal root ganglion (PRFT) for treatment of chronic back pain (CBP) with radiculopathy and the correlation between CBP and serum cholesterol level. Design: Prospective, randomized, open label study. Setting: Department of Anaesthesia, ICU, and Pain management, Pain unit, Assiut University. Patient(s): 80 patients having chronic back pain with radiculopathy were recruited in the study. Intervention(s): patients in the first group (40 cases in total) were treated by SNRB via transforaminal approach on the affected nerve root and patients in the second group (40 patients in total) were treated by PRFT to the affected DRG. Main Outcome Measure(s): primary outcomes included pain score measured by NRS, while the secondary outcomes included Oswestry Low Back Pain Disability Questionnaire (DIS), and at 0, 3 and 6 months intervals. Results: After 3 months and 6 months, a clear statistical difference was observed between 2 groups in pain score; patients in the second group felt better pain relief. In terms of secondary outcomes, no differences were observed between the groups in the disability score. Conclusion: Both SNRB and PRFT to DRG are effective procedures to treat CBP with radiculopathy. However, PRFT to DRG is a slightly more effective than SNRB. Both treatment options equalized regarding the disability score. Lumbosacral radicular pain (LRP) is a common symptom, its annual prevalence in the general population is reported to be from 9.9% to 25%  and it is characterized by a shooting, radiating pain to one or more dermatomes, which is often caused by irritation of the corresponding nerve root . The initial treatment should be conservative with oral medications, exercise, and physiotherapy. When conservative treatments fail, epidural steroid injections and other interventional treatments should be considered . Surgical interventions are indicated when all other treatments have failed. A primary goal in the treatment of CBP may be temporary alleviation of pain to enable the patient to become fully engaged in a physical therapy and rehabilitation program aimed at improving strength and body mechanics to minimize physical stress and provide more long-term relief . The role of epidural steroid injections in the treatment of sciatica has generated much discussion and debate over the last 50 years, and studies have produced highly variable results. Despite the lack of consistent results in clinical trials, lumbar epidural steroid injection (LESI) has become firmly established and is widely practiced in the management of sciatica. Steroids act at a cellular level by influencing the transcription of particular genes leading to increased synthesis of anti-inflammatory and decreased synthesis of pro-inflammatory proteins . A selective transforaminal approach allows better delivery of a concentrated dose of medication directly to the affected nerve root [ 6]. The application of radiofrequency (RF) to the dorsal root ganglia (DRG) has been studied and practiced for the treatment of chronic pain . The PRF treatment adjacent to the cervical DRG was recently advocated and reported to show significant pain relief at 3 months follow-up for the treatment of cervical radicular pain. The study is prospective, randomized, and open label, between 2 main groups; all patients in the first group (40 cases in total) were treated with SNRB via transforaminal approach whereas patients in the second group (40 patients in total) were treated with PRFL on the affected DRG. Local ethical committee in Assiut University hospital approved this study. The study started in 2013, and all patients signed a detailed written informed consent. All Patients fulfilled eligibility criteria were enrolled into the study. • Patient with chronic low back pain more6 months with signs and symptoms of nerve root compression (radicular pain). • The absence of a chronic or progressive motor deficit. • The absence of significant sensory deficit. • Known concurrent neurological or neurodegenerative disease, including those with impaired neurotransmission e.g. myasthenia gravis, multiple sclerosis, spinal cord injury etc. • Patient unable to complete the study or the procedure for any reason. • Any complications during intervention. Study groups: Eighty Patients were sequentially allocated to be in one of 2 main groups. Each patient in the first group (40 cases in total) was treated with SNRB via transforaminal approach on the affected nerve root by using 2ml of Lidocaine 1% plus 40 mg methylprednisolone (Depo-Medrol, Pfizer). Each patient in the second group (40 patients in total) was treated with PRFL on the affected DRG at 42 °C for 120 seconds only. Methods of patients' identifications: All patients were interviewed and examined by pain physicians. Patients were assessed for sensory, motor, or reflex deficit. Patients with lumbar or sacral radicular pain were to be included in the study and randomized. Procedure of Selective Epidural injections (SEI): In the prone position, the skin and subcutaneous tissue were infiltrated by using 1% lidocaine after sterilization, and anRF electrode (22-G, 10 cm needle, with a curved 10 mm active tip) was inserted paraspinal under fluoroscopic guidance. The end points of the needle can be verified via anteroposterior view where the needle was not advanced medially further than the lateral aspect of the corresponding pedicle and on the lateral view, the needle tip was localized in a retroneural position. 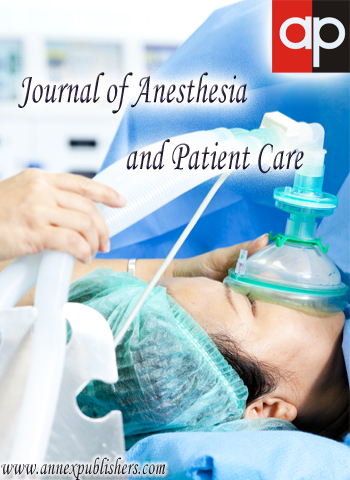 The Non-ionic contrast was initially injected to outline the contour of the target nerve and determine the amount of local anesthetic needed to avoid significant central epidural spread. The volume of 1.0-1.5 mL (both 2% lidocaine and 40 mg of methylprednisolone acetate) was injected. a) Sensory stimulation (50 Hz) threshold under 0.6 volts which made paresthesia in the usual distribution of radicular pain. b) Motor stimulation at 2 HZ caused weak muscle contraction at target nerve. The stimulation was above 2 volts to ensure that the probe was far away from ventral horn cell and so close to DRG. c) Impedances were important to confirm a complete electrical circuit; it ranged from 200 to 400 Ohms. PRF Treatment: Radiofrequency current was applied for 20 ms, at 2 Hz, for 120 second. A maximum target temperature was 42 °C. All patients were observed after the procedure in a special ward for at least 30 minutes with recording of any adverse effects or complications. Blood pressure and pulse oximetry continuously monitored. Pain, vomiting, hypotension or leg weaknesses were reported. Patients with lower limbs weakness were reassured and waited for one hour. Vomiting was treated by antiemetic drugs and intravenous fluids whereas pain in the back or leg was managed by reassurance and analgesic drugs. Before discharge, all patients received necessary instructions and contact numbers. All patients were followed up on their subsequent visits to the pain unit or by telephone interview at 0, 3 and 6 months. Pain was rated using standard 10-point Numerical Pain Rating scale (NRS) with 0 being no pain, and 10 representing the worst pain imaginable. Functional ability was evaluated using Oswestry Low Back Pain Disability Questionnaire (DIS) at 0, 3 and 6 months. Patients were followed on a monthly basis to determine the duration of relief. All data was examined by Excel program then analyzed with SPSS software (Statistical Package for the Social Sciences, version 16, SSPS Inc, and Chicago, USA). All descriptive statistics (quantitative parameters) of the study were done in the form of means, minimums, maximums and standard deviations and standard error (SE); absolute and relative frequencies were used to report qualitative variables. In Categorical data, Chi-squared test was used and Mann-Whitney U test was used for non-parametric data. P values were considered statistically significant if < 0.05. Eighty patients with CBP with radiculopathy were successfully recruited and all these patients were involved and continued till the end of the study. Regarding the demographic data, about two-third of cases were male (62% in SNRB group versus 67% for PRFL group). The average age was 53.7 ± 11.9 for SNRB group and50.4 ±12.6 for PRFL group (Table 1). i) Pain score: Both PRFL and SNRB groups showed clinically significant improvement in the NRS at 3 and 6 months (P<0.001). However, PRFT group had significant better NRS than SNRB group at 3 and 6 months (p values were 0.013 and 0.001 respectively). The average pain score for all patients before the procedure was about 8 ± 0.7. However, after 3 months, this score significantly decreased to about 4.03 ± 1.17 and 3.20 ± 1.5 for SNRB and PRFT groups respectively. After 6 months, the average pain score for SNRB group climbed slightly to 4.75 ± 1.69 while for PRFT, it was 3.48 ± 1.30 (Table 2, Figure 1). No patient in the current work reported any major neurological complication. However, transient dermatomal discomfort, numbness, burning or weaknesses were reported in few cases that resolved spontaneously within few days. Elevation of blood sugar due to use of steroids was observed in some patients, particularly those who have diabetes. The current study confirms that PRFT is superior to SNRB for pain management in patients with CBP with radiculopathy. Vad et al. cited that selective nerve root block appears to have a short-term improvement, but a subsequent rebound effect can develop. The transforaminal approach is very target specific, using the smallest amount of injectate possible to reach the primary site of pathology . The current study states the safety of both used techniques for treatment of radicular pain. Geurts et al cited that there were no obvious differences regarding to adverse events and complications between selective epidural and PRF techniques . Contradictory to the results in the current study, Hildebrandt, cited that epidural steroid injections might not be effective. The benefits of epidural steroid injections seem to be of short duration only. Furthermore, it is unclear which patients benefit from these injections . Review articles and literatures have failed to demonstrate evidence of therapeutic superiority for transforaminal injection . However, these contradictory results can be attributed to patient selection criteria as in the current work all patients had radicular pain for more than 6 months. In accordance to our results, Van Zundert et al. reported that many studies showed both safety and potential efficacy for PRFLin the treatment of lumbar radicular pain, emphasizing its nondestructive nature. These findings are reliable with the previous data of Van Zundert et al. in using PRFL for treatment of the cervical DRG. They imply that the use of PRFL in treatment of lumbar DRG is safe and effective . Van Zundert et alreported also that the cure rate for PRFLis (70%). However the analgesic effect decreased significantly after 4 months . This decline may displaythe difference between placebo and actual treatment effects. In a study Koh et al. revealed that the number of patients with successful treatment was higher in the PRF group at 2 months (P = 0.032) and 3 months (P = 0.018) and there were no significant differences observed in terms of the secondary outcome variables between the 2 groups . Van Zundert et al. reported thatthere were no differences in the baseline NRS scores among the different diagnostic groups (P = 0.90). The NRS scores after a month (P < 0.05) and 2 months (P < 0.01) were obviously higher in failed back surgery syndrome(FBSS) group, with no differences between the Herniated disc (HD) and spinal stenosis (SS) groups at any time point studied. NRS score declined significantly in patients with HD (P < 0.05) and SS (P < 0.001), but not in those with FBSS  and this implies that FBSS patients are least to improve.We assume that different studies showed variable results due to , at least in part, the variability in patients selection criteria among these studies. In our study, the average pain for all patients who were treated by steroid before the study was about 8 ± 0.7. However, the pain score after 3 and 6 months has become 4.03 ± 1.17 and 4.75 ± 1.69 respectively. Regarding PRFL, the pain score before the study was 7.93 ± 0.7, but after 3 and 6 months, the score had become 3.20 ± 1.5 and 3.48 ± 1.30 respectively. 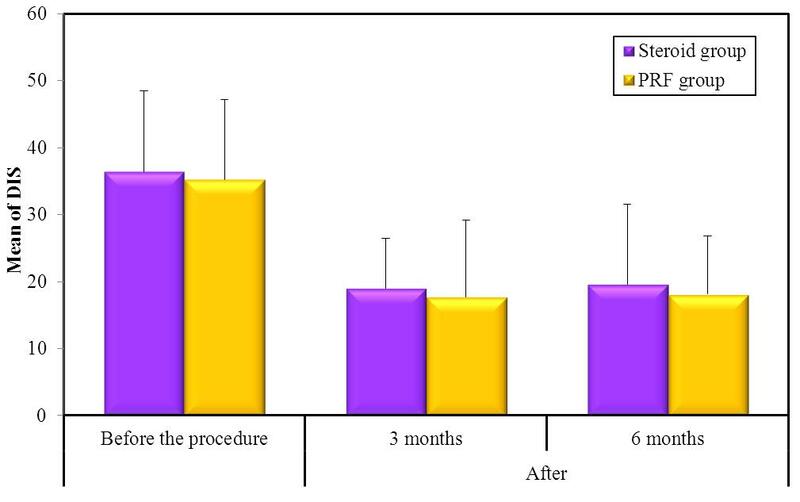 The maximum advantage for pain improvement in our study was after 3 months in both procedures. It is recommended to follow all these patients for longer duration to seek the ultimate duration for pain relieve in these patients. 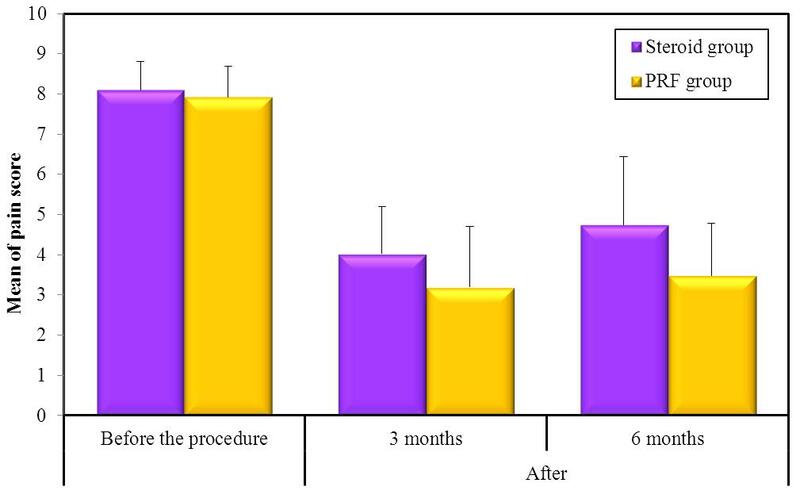 For DIS score, there was no statistical significance between groups of patients who treated by selective epidural and radiofrequency after 3 or 6 months. Van Zundert et al. cited that all patients undergoing PRFL had a positive response (50% improvement in the symptoms lasting at least 6 hours). The treatment was always applied close to the targeted DRG for 120 seconds at a constant voltage (45 V) and the voltage was constantly adjusted in some cases to maintain the tip temperature at a maximum of 42 °C. The pretreatment impedance was controlled, and saline was sometimes injected to reduce it below 450 ohms . In our study a parameter used in PRFT was as follow: the current lesion applied was for 20 ms, at 2 Hz, for 120 second. A maximum temperature was 42 °C. Sensory stimulation (50 Hz) threshold was under 0.6 volts which made paresthesia in the usual distribution of radicular pain while Motor stimulation was at 2 HZ caused weak muscle contraction at target nerve. The stimulation was above 2 volts to ensure that the probe was far away from ventral horn cell and so close to DRG. The Impedances was about 300 Ohms. For selective nerve root block, the volume was 1.0- 1.5 mL (both 2% lidocaine and 40 mg of methylprednisolone acetate). In our study, the need for further medical treatments was not examined and there is no data about the effect of both methods of treatment in reducing the doses of analgesic drugs, antidepressants, anticonvulsants and/ or other medical treatment. There are lots of variables had to be recorded such as the duration of the chronic back pain, which is the most important factors in treating patients with chronic pain. Another essential factor is related to any previous back surgeries, which had an important impact on the effectiveness and the selection of treating methods. Severe depression is more likely to have bad results even in good interventions and we should bear in our mind such dilemmas before starting of any study. However, there were some limitations in our study that should be reported; a small sample size can limit potentially the use of the data from our result to general population. The study was open label, and it is required to assess the outcomes for long period to determine whether the benefits of treatment will persist for more than 6 months. Some measures were reported by using self-report tools which can affect the credibility of responses, but it is considered the most convenient and reliable way in gaining these data. The study did not take in consideration the link between pain severity or type of patients and the disturbance of cholesterol serum level. Another important factor may have impact on the level of cholesterol and back pain which is BMI. This factor should be evaluated in any further studies. We conclude that PRFL is superior to transforaminal steroid injection for relieving radicular pain. 1 Stender S, Dyerberg J, Astrup A (2007) Fast food: unfriendly and unhealthy. Int J Obes (Lond). 31: 887-90. 2 Stafford MA, Peng P, Hill DA (2007) Sciatica: A review of history, epidemiology, pathogenesis, and the role of epidural steroid injection in management. Br J Anaesth 99:461–73. 3 Ackerman WE, Ahmad M (2007) The efficacy of lumbar epidural steroid injections in patients with lumbar disc herniations. AnesthAnalg 104: 1217–22. 4 Roine E, Roine RP, Rasanen P, Vuori I, Sintonen H, et al. (2009) Cost-effectiveness of interventions based on physical exercise in the treatment of various diseases: a systematic literature review. Int J Technol Assess Health Care 25: 427-54. 5 Jusko WJ (1995) Pharmacokinetics and receptor-mediated pharmacodynamics of corticosteroids. Toxicology 102: 189-96. 6 Staal JB, De Bie RA, De Vet HC, Hildebrandt J, Nelemans P (2009) Injection therapy for subacute and chronic low back pain: an updated Cochrane review. Spine (Phila Pa 1976) 34: 49-59. 7 Manchikanti L, Buenaventura RM, Manchikanti KN, Ruan X, Gupta S, et al. (2012) Effectiveness of therapeutic lumbar transforaminal epidural steroid injections in managing lumbar spinal pain. Pain Physician 15: E199–245. 8 Vad VB, Bhat AL, Lutz GE, Cammisa F (2002) Transforaminal epidural steroid injections in lumbosacral radiculopathy: a prospective randomized study. Spine (Phila Pa 1976) 27: 11-6. 9 Geurts JW, Van Wijk RM, Wynne HJ, Hammink E, Buskens E, et al. (2003) Radiofrequency lesioning of dorsal root ganglia for chronic lumbosacral radicular pain: a randomised, double-blind, controlled trial. Lancet 361: 21-6. 10 Hildebrandt J (2001) Relevance of nerve blocks in treating and diagnosing low back pain--is the quality decisive? Schmerz 15: 474-83. 11 Van Zundert J, Lame IE, De Louw A, Jansen J, Kessels F, et al. (2003) Percutaneous pulsed radiofrequency treatment of the cervical dorsal root ganglion in the treatment of chronic cervical pain syndromes: a clinical audit. Neuromodulation 6: 6-14. 12 Simopoulos TT, Kraemer J, Nagda JV, Aner M, Bajwa ZH (2008) Response to pulsed and continuous radiofrequency lesioning of the dorsal root ganglion and segmental nerves in patients with chronic lumbar radicular pain. Pain Physician 11: 137-44. 13 Koh WU, Choi SS, Park SY, Joo EY, Kim SH, et al. (2013) Transforaminal hypertonic saline for the treatment of lumbar lateral canal stenosis: A double-blinded, randomized, active-control trial. Pain Physician 16: 197–211. 14 Van Zundert J, Patijn J, Kessels A, Lame I, Van Suijlekom H, et al. (2007) Pulsed radiofrequency adjacent to the cervical dorsal root ganglion in chronic cervical radicular pain: a double blind sham controlled randomized clinical trial. Pain 127: 173-82.